Factual error: During one of the cabinet meetings, one of the members says Collins' brief is Minister for Intelligence, but he was actually Minister of Finance. He was, however, the IRA's Director Of Intelligence. Factual error: The Lee Enfield rifle is chambered by singular repetitions with a bolt action. When Collins' wayward friend is shot in the water, the rifle shots are rapid semi-automatic fire. Trivia: While Collins is often credited with creating guerrilla warfare, he is never seen killing anyone in the film. Trivia: Brendan Gleeson, who plays Collins' aide Liam Tobin, played Collins in the 1991 TV movie The Treaty. Eamon de Valera: They call us murderers. 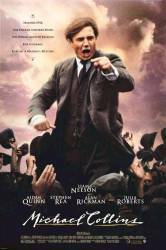 Michael Collins: War is murder! Sheer, bloody murder! Had you been here the past year, you'd know that. Eamon de Valera: The Irish people established the Irish Republic. It can only be disestablished by the Irish people.